How to confuse a candidate Warminster style. NOMINATIONS are in and the month-long election campaign in Warminster is under way. In visionforwarminster we have been trying to raise the issues that people have talked to us about and now we are out and about asking people for their support. The only thing is we’re not always sure if we are asking in the right places. With new electoral divisions now in place there is some confusion about which street is in which seat. In some places there is great confusion - none worse than at The Grove. Part of The Grove (the eastern part) is in the west ward while the western part is in east ward. 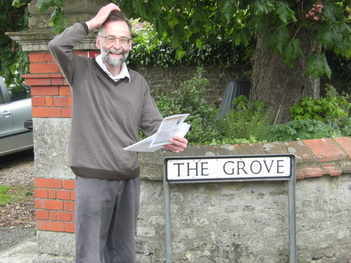 “Some of the boundaries make no sense at all but what has happened in this street harks back to the days of the rotten borough,” said Steve Dancey. “In those times some parishes has property miles away from the parish and with no geographical connection at all. “The few houses at the front of The Grove are in the west ward but are entirely surrounded by properties in the east ward. “What went on when the divisions were drawn up and is it true a child did some alterations with a felt pen? “There’s also some confusion in The Mead with the older houses in west but the old folks’ bungalows in in east. Pictured: Even experienced old campaigner Paul Macdonald has seen nothing like it.